It is a common misconception that the elimination of waste is the prime objective for Lean organizations. This isn’t one bit surprising. After all, it’s called “Lean,” and the eight wastes are clearly defined and talked about all of the time. But nonetheless, the elimination of waste is not the ultimate goal of Lean. Waste reduction is one approach to achieving what really matters - providing perfect value to the customer through a flawless value creation process. Think about the last time you chose to buy one brand among several similar competing products, paper towels, for example. Something tipped the scales in favor of the brand you chose - but it probably had nothing to do with how efficient you deemed the factory that produced them to be. Customers don’t care about how much waste exists in your organization, but they do care about price, quality, features, and product availability. The most successful Lean organizations target waste that directly impacts something that the customer cares about. Reasonable people can disagree on the best brand of paper towels to buy. I may choose the least expensive because I’m on a tight budget, while you might choose a higher quality brand because you’ve got a big messy job to tackle. What we value in that moment is not the same. Lean organizations understand that value is in the eye of the customer, that each person’s assessment of value can change based on circumstances, and that sometimes providing value to one customer sacrifices it for another. One huge mistake that Lean organizations don’t make is assuming that they understand how the customer perceives value. Instead of guessing, Lean leaders find ways to validate their beliefs about value with the actual customers. One approach is to take the Lean technique of Gemba Walks, where leaders go to the place where work is done to observe processes in action, on the road. Seeing how your customers interact with your product in the real world provides tremendous insight into value. Most lean organizations are familiar with the concept of value stream mapping in which each process is mapped out to identify and separate activities that add value from waste. 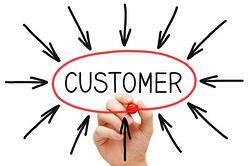 A deeper understanding of customer value can often be gained by applying this same approach to your customer. How does your product or service fit in with their business or life? Are there other products or services used alongside yours? Is there a way that you can remove friction between your customer and their goals? Don’t get us wrong, we are huge fans of identifying opportunities to eliminate waste. We know that unprofitable companies don’t provide great products and services for very long. But it is critical in a robust improvement culture that the ultimate goal of providing value to the customer remains in clear focus. In the end, it is only the customer who will decide if you have succeeded.